This page contains a character guide for Gorilla Grodd in Injustice 2. Here you’ll find movelists, combos, juggles, strategy guides and recommended gear for the villain character. For more Injustice 2 content, head over to our Injustice 2 top page. Years ago, a collection of gorillas were exposed to radiation emitting from a fallen radioactive meteorite. Consequently, they gained super-intelligence and psychic powers. Using their newfound intellect, the gorillas established a technologically advanced utopia hidden in Africa and decided to reside in it, dubbing it Gorilla City. 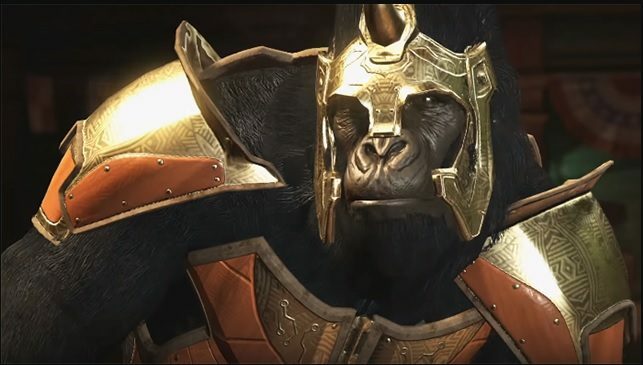 Gorilla City was initially led by the wise and just King Solovar, but the insane super-simian known as Grodd sought to conquer Gorilla City and eliminate humanity to ensure the superiority of apes worldwide. Luckily, The Flash was contacted by Solovar and defeated Grodd. In the following years, Gorilla Grodd’s battles with the Flash and attempts to conquer or destroy humankind have been numerous, but to no avail. Grodd has also been a member of the Legion of Doom and the Injustice League. Allows Gorilla Grodd to use Telekinesis-based Special Moves and enhanced Combo Attacks. Must have Telekinesis to perform Savage Strength. Gorilla Grodd becomes immune to projectiles while Savage Strength is active. Below are combo and juggle inputs for Gorilla Grodd , including corner strategies and restarts. 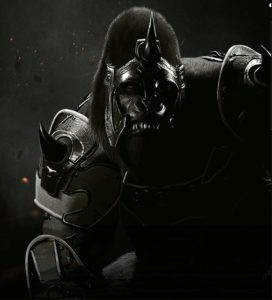 Gorilla Grodd lives up to his name as a massive gorilla, easily twice the size of a full-grown man and wears golden armor consisting of gauntlets, shoudler pads, knee pads, a belt, and helmet. He is a support card in the Injustice Gods Among Us iOS game. He is the only non-playable character to appear during the end credits.